Shifts in climate are strongly linked to human violence around the world, with even relatively minor departures from normal temperature or rainfall substantially increasing the risk of conflict in ancient times or today, according to a new study by researchers at the University of California, Berkeley, and Princeton University. 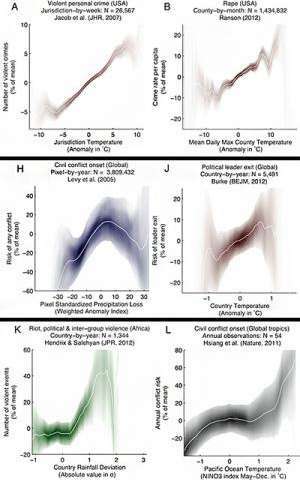 The results, which cover all major regions of the world and show similar patterns whether looking at data from Brazil, China, Germany, Somalia or the United States, were published today in the journal Science. By amassing more data than any prior study, the authors were able to show that the Earth's climate plays a more influential role in human affairs than previously thought. The study data covers all major regions of the world and show similar patterns of conflict linked to climatic changes, such as increased drought or higher than average annual temperature. Examples include spikes in domestic violence in India and Australia; increased assaults and murders in the United States and Tanzania; ethnic violence in Europe and South Asia; land invasions in Brazil; police using force in Holland; civil conflicts throughout the tropics; and even the collapse of Mayan and Chinese empires. Although there has been a virtual explosion in the number of scientific studies looking at how climatic impacts shape human conflict and violence, especially in in recent years, the research stems from disparate research fields ranging from climatology, archaeology and economics to political science and psychology. "What was lacking was a clear picture of what this body of research as a whole was telling us," said Solomon Hsiang, the study's lead author, who was a postdoctoral fellow in Science, Technology, and Environmental Policy at Princeton during the research project and is now an assistant professor of public policy at UC Berkeley's Goldman School of Public Policy. "We collected 60 existing studies containing 45 different data sets and we re-analyzed their data and findings using a common statistical framework. The results were striking." The latest study adopted a broad definition of conflict and used the latest research methods to re-evaluate what they found to be the most rigorous quantitative studies released since 1986 to examine aspects of climate such as rainfall, drought or temperature, and their associations with various forms of violence. Institutional breakdowns, such as abrupt and major changes in governing institutions or the collapse of entire civilizations. They found that all three types of conflict exhibit systematic and large responses to changes in climate, with the effect on intergroup conflict being the most pronounced in percentage terms. The authors found that conflict responded most consistently to temperature, with all 27 out of 27 studies of modern societies finding a positive relationship between high temperatures and greater violence. A central contribution of the study was to develop a method for comparing results around the world, because the nature of climatic events differs across locations. The authors' new approach was to convert climate changes into location specific units known to statisticians as standard deviations. "We found that a 1 standard deviation shift towards hotter conditions causes the likelihood of personal violence to rise 4 percent and intergroup conflict to rise 14 percent," said Marshall Burke, the study's co-lead author and a doctoral candidate at Berkeley's Department of Agricultural and Resource Economics. "For a sense of scale, this kind of temperature change is roughly equal to warming an African country by 0.4°C (0.6°F) for an entire year or warming a United States county by 3°C (5°F) for a given month. These are moderate changes, but they have a sizable impact on societies." "We often think of modern society as largely independent of the environment, due to technological advances, but our findings challenge that notion," said study coauthor Edward Miguel, the Oxfam Professor of Environmental and Resource Economics and director of the Center for Effective Global Action (CEGA) based at UC Berkeley. The researchers said that exactly why climate affects conflict and violence is the most pressing question for future related research. "We're in the same position that medical researchers were in during the 1930s: they could find clear statistical evidence that smoking tobacco was a proximate cause of lung cancer, but they couldn't explain why until many years later. In the same way, we can show that climatic events cause conflict, but we can't yet exactly say why," said Hsiang. 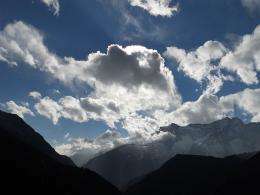 "Currently, there are several hypotheses explaining why the climate might influence conflict. For example, we know that changes in climate shape prevailing economic conditions, particularly in agrarian economies, and studies suggest that people are more likely to take up arms when the economy deteriorates, perhaps in part to maintain their livelihoods." Burke said there are very likely multiple mechanisms at play, since no single theory explains all of the evidence. "The studies showing that high temperature increases violence crime in the U.S. and other wealthy societies seems to suggest that physiological responses are important, too, with very short-run exposure to heat contributing to more aggressive and violent behavior," he said. Nonetheless, in all cases, Burke noted "the collected evidence shows that humans across the globe have proven poorly equipped to deal with exposure to hotter temperatures." While the study finds strong evidence that climatic events may be a cause of conflict, the researchers stressed that they are not claiming that climate is the only or primary cause of conflict, cautioning that conflict dynamics are complex and remain poorly understood. "Say you look at data on car accidents," offered Hsiang, "and you see that they become more likely on rainy days. Does that mean that rain is the only factors responsible for accidents? Of course not. Driver error ultimately causes accidents but rain can make it much more likely. Similarly, violent conflicts might occur for a variety of reasons that simply become more likely when climatic conditions deteriorate." "Our results shed new light on how the future climate will shape human societies," said Burke. The findings of the study suggest that a global temperature rise of 2 degrees Celsius could increase the rate of intergroup conflicts, such as civil wars, by over 50 percent in many parts of the world. "It's possible that future societies might figure out better ways to cope with hot temperatures and variable rainfall, and indeed we hope that they will," said Miguel. Nevertheless, the authors argue that it is dangerous to assume that people will cope well to extreme climate when they have not done so historically. "We need to understand why climate changes cause conflict so we can help societies adapt to these events and avoid the violence. At the same time, we should carefully consider whether our actions today are making our children's world a more dangerous one," said Hsiang. More information: "Quantifying the Influence of Climate on Human Conflict," by	S.M. Hsiang	et al. Science, 2013. Will climate change cause water conflict? The one that "matches" violence most closely isn't temperature, at least by looks, but rainfall. Deprivation, poor economic conditions and the like when rains fail makes sense. People become more desperate, especially if they feel there is no end in sight. So large American cities that have fluctuating economic fortunes are, probably, more likely to experience violence. I think at least Detroit qualifies under this model. Fluctuating climate and weather can lead to more catastrophic events on a smaller scale, events that serve, as a whole, to cause more economic damage than any single major disaster. This is what we've seen in a few recent years in the United States, actually. Keep that up and insurers either go under or have to charge higher rates, and it all economically rolls downhill from there. It's interesting that our research managers continue to fund research into questions that appear to have rather obvious answers, and yet simultaneously seem unconcerned about collecting data which might cast doubt upon anthropogenic global warming. One would think that embarking upon the largest scientific expenditure in the history of mankind might raise expectations for rigor sufficient to try to also disprove the validity of the models. "During the January 1997 magnetic cloud event, 47% of the solar wind energy was deposited in the form of Joule heating, while 22% was in the form of particle heating ..."
Yeah, it's interesting that a new set of trolls has been planted on this article. Just another way to justify the denial of climate change.